NYSUT launched LAP in 1994 to encourage local unions to be more engaged with their communities - not only during contract discussions, but on a continuing basis. Last year, Great Neck Teachers Association applied to be a part of this unique union program. After a competitive application process, we were thrilled to be selected to participate in LAP! 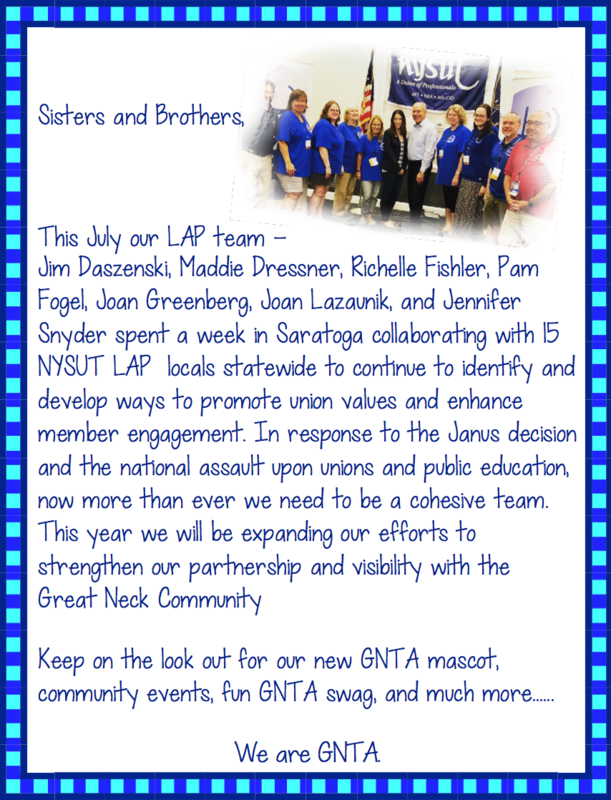 For the next three years, our local LAP Team: Joan Greenberg, LAP Chair; Jim Daszenski, GNTA President; Pam Fogel, Paraprofessionals Association President; Joan Lazaunik, Office Staff Association Co-President; Jennifer Snyder, GNTA VP, Professional Rights & Responsibilities; Madeline Dressner; Richelle Fishler; and Pete Lanzo, Labor Relations Specialist will receive training and be given resources and support, as well as funding, from NYSUT. The LAP Team will attend conferences, seminars, and workshops to learn proven strategies for increasing member engagement, building community support for key initiatives and achieving results in contracts, elections, and more. Of course, this is all accomplished while focusing on ensuring the highest quality public education for all students! 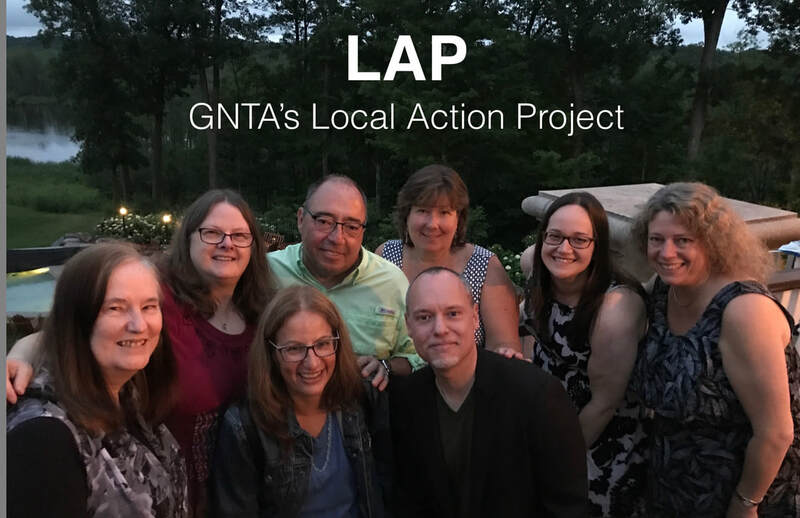 The LAP experience has value for participants from every category of NYSUT membership, and we are pleased to have representation on our LAP Team from our GNTA union and its affiliates. 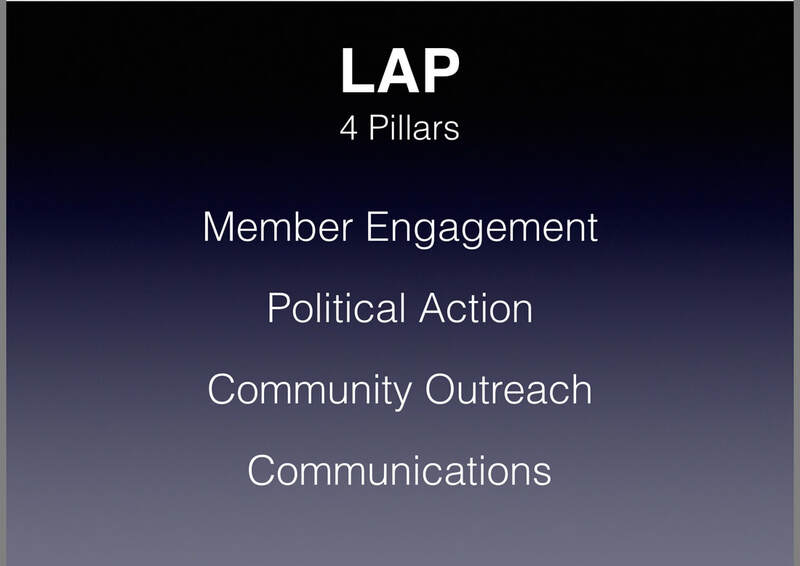 LAP increases a local union’s effectiveness by focusing on four key components: increasing membership engagement, strengthening political action, expanding community outreach/coalition-building, and improving communications. The LAP program includes training in internal organizing, technical assistance in designing and developing external and internal communications, community surveys, and leadership training in group process, decision-making, planning, implementation and evaluation. The need for LAP is so critical in today’s political and educational climate. NYSUT locals are continually being challenged by anti-union forces and their organized efforts to diminish contracts, benefits and support for public services, public employees, and especially public education. In the few months since the LAP Team’s first conference in Saratoga during the summer, we have accomplished a lot! The VOTE NO to the CON CON campaign was an overwhelming success! Tied to that was collecting CANS CANS for CON CON as a way to give back to our community and those less fortunate. We distributed water bottles at the children’s Halloween event at North High School, and we’ve been a presence at Board Meetings, community events, etc. We have designed and purchased new GNTA t-shirts that reflect our large number of members and affiliates. These new shirts will be distributed at an Open House at the Cottage on Monday, February 12, a chance for all GNTA members and affiliates to come together and fall in love with our union! Be on the lookout for more activities and more items with the GNTA logo as we continue to engage members and reach out to the community. Get involved, have those meaningful conversations with colleagues and friends and family. If you have any questions, any of the LAP Team members would be happy to speak with you. We’ve accomplished so much, but there is still so much to do. We thank you all for all that you do!